Whittling is one of the longest and cherished pastimes known to man and especially Americans. During the late 1700s and up until the mid-1900s, Americans have been known to always be whittling. Some might say that is has fallen out of fashion, but to the contrary, there are tons of people who know how to whittle. So let’s look at what whittling entails, how to do it, and what the skills of whittling can be employed to do. First, here’s a brief introduction to what whittling is. Whittling is the art of carving pieces of wood with a carving knife or pocketknife. Generally, whittling is done on a small scale, such as carving little sculptures of animals, making a tool, or some other object. Unlike other types of wood carving (http://www.bestwoodcarvingtools.com/wood-carvers-beginner-guide/), whittling creates a sculpture or object. A distinguishing feature of whittling is that knife strokes, or cuts, are visible and add a rustic, rugged feel to the object being made. What are the Basic Cuts? Straightaway Rough Cutting: This cut is when you push the blade away from yourself. It is generally used at the beginning of whittling projects to fashion the general shape of the object. Execute thin, long cuts and avoid pushing to deep or the wood could split. The Pull Stroke (Pare Cut): The Pare Cut is the most used cut in whittling. To perform this cut, grasp the wood with your left hand and the knife in your right hand. Brace the wood with your right thumb and pull the knife towards you, making a thin cut. Be cautious of where you place your thumb to not injure yourself as the blade comes toward you. The knife should be held firmly, allowing great control. This cut is mainly used for detailing the object. Push Stroke (Thumb Pushing Cut): Sometimes, the wood will not allow for the pare cut. When this is the case, using the push stroke should do the trick. Again, hold the wood in your left hand with the knife in your right. Set the blade firmly against the wood and place both thumbs over the back of the blade. Push with your left thumb and use your right to guide the knife. This cut also affords solid control and can be used to make detailed cuts. With a knowledge of the basic cuts, you too can now whittle small objects. However, knowing how to work with the wood is vital to whittling success. Carving with the grain of the wood makes whittling much easier, avoiding lots of potential frustrations. First, you will need to decipher the direction of the grain. If it is not obvious, make a shallow push cut going in either direction and see which one provided the least resistance. The least resistant cut will be with the grain. IMPORTANT: Cutting against the grain will make whittling difficult, eventually tearing and splitting the wood. Not only is it difficult and impractical, it is also dangerous. With the extra resistance, whittlers will use more force, which can cause a slip and injury. The same principle goes for dull blades. Always keep your knives razor sharp in order to reduce the risk of injuring yourself. How Can I Utilize Whittling Skills Outdoors or While I’m Camping? Tent Stake: Whittling is especially helpful if you need a tent stake. Tent stakes are easy projects and essential when needing to pitch a tent for the night. Fishing Spear: Forgot the fishing gear? Not a problem for whittlers. Finding a long piece of sturdy wood and taking the time to fashion a nice point out of one of its ends will yield a perfect spear to catch fish. Whistle: Whether you need to signal someone for help or are just itching to impress your friends, whistles are prime products of whittling. A short, yet slender piece of wood and a sharp knife can make some amazing sounds. Whatever you may want to use whittling for, it is a fun and easy skill to come by. Practicing over the years will allow you to become an expert whittler and can lead to projects on a grand scale. My name is Nathan and I have been wood carving for over 8 years. I own and operate a wood carving website (http://www.bestwoodcarvingtools.com/) that provides useful and valuable information to those looking to learn the craft or find a solution to their problems. To see all-inclusive introduction guides to wood carving visit http://www.bestwoodcarvingtools.com/wood-carvers-beginner-guide/ for more information. For timeless whittling knives, check out the large selection of Great Eastern Cutlery pocket knives. When it comes time to do your holiday shopping, many folks like to choose gifts that will be used for years to come and truly enjoyed by the recipient. At the same time, many gift-givers are drawn to beautiful gifts that are personalized for the recipient. Why not choose the holiday gift that does both — a personalized, engraved knife? An engraved knife makes an ideal Christmas gift because it combines the best of both worlds — the functionality of a high quality pocket knife with the beauty and personal touch of custom engraving. It’s an especially good gift for that hard to buy for man in your life, because who doesn’t need a handy pocket knife or Swiss Army knife now and then? An engraved knife is the kind of gift that will be treasured for years and, if it is heirloom quality, passed down to the next generation as a cherished memento. Engraved knives have always been an appreciated and welcome gift for a variety of occasions, such as groomsmen’s gifts for weddings or for a special anniversary or birthday present. An engraved knife makes a good competition prize. Also, some employers choose to give pocket knives engraved with the company logo to their employees as a Christmas gift or in recognition of a job well done. And some people choose to have a knife custom engraved with the date of a special camping trip. These days, engraved knives are available in many styles: All-purpose pocket knives, Swiss army knives, survival knives, rescue knives, military knives and chef’s knives can all be engraved and personalized for gifting. Some gift givers even choose to have beautiful, useful fillet knives engraved for the fisherman in their life! And depending on the style you choose, engraved knives come in either all-metal styles or with beautifully grained wooden handles. That kind of versatility and variety of choices make an engraved knife (of any type) a perfect Christmas gift. Custom engraved knives can include the name of your friend or loved one, a special date or message, perhaps even a small image or symbol — things that make the personalized engraved knife a special and meaningful Christmas present that is certain to be treasured. If you’re a wife shopping for a hard-to-buy-for husband, he’ll be pleased to receive an engraved knife because it’s a considerate gift that he can truly use. Since you want the gift to last a lifetime, be sure to choose the very best quality knife possible, whatever style of knife you choose. Read reviews of the knife and be sure it’s one that is actually used by people who use knives on a regular basis and expect performance as well as style. Combine thoughtful personalization with a knife of excellent quality and workmanship, and you have a holiday gift that the recipient will carry and use almost every day. So for a thoughtful and useful Christmas gift for the guys (or even gals) on your list, it’s a good idea to consider engraved knives. They’re the kind of gift that won’t be re-gifted! Today, we’re back with our highly popular segment “10 questions with” and I had the opportunity to speak with Jim Stewart of Bark River Knives. Jim has a passion for knives and has a unique design style all of his own. He’s also one of the nicest guys you can possibly meet. Q: Jim – as most folks reading our blog know, you are Mike Stewart’s son. Mike is unquestionably an industry legend and in many ways a man who has really created the semi-custom/production knife market. What are some of the challenges and opportunities associated with being the son of a knife making legend? A: Man, that’s a great question. I’d say that some challenges that any family members that do business together face, centers on patience! We all love each other and we want to do well, so there’s a lot of pressure we put on each other to make sure the product is the best it can possibly be. Sometimes that can strain, but ultimately, it brings us closer together as a family. It brings us all a sense of pride and accomplishment knowing that we all helped together to lead to the success we see today. I have a wealth of opportunities through the knife industry and I’m grateful for every one of them. The business contacts and the friends (one in the same) I make lead to a great knowledge base, and we all know that knowledge is power! This allows us to not only capitalize on opportunities that arise, but let us make our own. Q: Having seen your own designs and customs your knives really have a unique look and style that sets your work apart. What influences your designs and how do you go about bringing these designs to life? A: Believe it or not, I’ve pulled a lot of visual influence for knives from the tactical market. Integrating certain features and adapting them to the Bark River style is always a fun experience. A great example would be the front-end of my Springbok. The visual pairing of the front point of the handle with the beginning of the grind line draws your eye to the blade and really helps the look stand out from the crowd. Almost like using the rule-of-thirds in photography and filmmaking to help bring the eye to where you need it to be on that frame or shot. Q: Talk to us about some knives or knife projects you would bring to life just for fun. A: Just for fun? One word: Razors. Straight razors are a natural leap for edge junkies like me. Bringing metal to that level of refinement and a literally hair-splitting edge is definitely a BAMF feeling. I’ve been studying and shaving with straights for 2 years now, and they are incredibly addicting. I’d love to spearhead a run of high-end quality straight razors, complete with video instruction. I’d even go so far as to find soaps and brushes and offer a package. Q: What is your official capacity at Bark River Knives and what do you do on a daily basis? A: I am head of Process and Project management. I organize the 100+ unique materials for each batch run of Bark River Knives and make sure it is all on hand and machined before we start each batch. Including all fasteners, liners, guards, pommels, etc. This is on top of finding, adapting, and implementing hand-finishing techniques into a larger scale production run. We fit the Mid-Tech production model to a T. My work is typically within 3 month projections with several batches of knives varying across our entire line. When I finish planning that quarter, I move onto the next. It never ends, and I love it. I also am directly involved with designing and prototyping future projects. All new models have been overseen by both my father and I.
Q: What is your favorite Bark River Knife that has been produced and why? A: I may come off as self-serving, but I love my Springbok. I designed it to be quick in the hand, deft, sharp, and stout without sacrificing comfort. When you pick it up it becomes an extension of your arm for any task that you can throw at it. I designed it selfishly, to be an answer to any hunting or bushcraft task that I needed. After bringing it to market, I was relieved to find that I wasn’t the only one who felt that way! Q: Jim – I know you are a bit of a Star Wars fan. What Bark River Knife would Luke Skywalker and Darth Vader carry and why? A: I’m a huge Star Wars fan, and I love that you asked me that. I’m really excited for VII this December! Luke would carry a Parang to get himself through those dense Dagobah swamps, if the Force were to fail him. Vader? I think he’d wear a Bravo Survivor. Black sheath, Black Canvas, with a red liner to represent the Sith. I don’t think it would print much against that cape. All too easy. Q: You’re a smart guy that stays up-to-date on current events and the knife industry. What is the biggest challenge we face right now? A: The biggest challenge, as knife enthusiasts and makers, that we face is the obfuscation of knives as weapons. This falls into the “unthinking knee-jerk emotional reaction based on fear through misunderstanding” paradigm that we have to combat every day. When anti-knife (and anti-gun) legislation is written and pushed through, it is never in the interests of the vast majority of citizens that are completely law-abiding. It may be written with good intent, but it is written by people that have no knowledge of the subject they are writing about and from an emotionally reactive standpoint. The laws created to “combat violence” do nothing but hamper good people, leaving criminals to still act exactly the way they were before. Instead of realizing this, politicians just repeat themselves in a different way. What is it called when something is repeated over and over achieving the same result, but expecting something different? Insanity. Q: I grew up working with my family in a small family business so I know the challenges it can create. To me, I always felt the highs were a little higher and the lows were a little lower but the thing that brought me to owning my own business was the fact that good or bad I was responsible for my success or failure. What are your thoughts on family businesses? A: I feel the same way. Working for yourself and succeeding feeds into that sense of personal accomplishment that is matched in no other way. To alter a platitude, The path to success is paved with bricks of suckage. You have to take the lows in stride, and use those points as learning experiences to gain a higher ground. You have no failures. You merely find ways things won’t work, which is a success in itself. Working with family can be trying, but if you work together and help each other through those lows, the family itself all grows closer together and more successful. I think other people can see that bonding strength, and it brings respect with it. Q: What knife do you EDC most typically? Why do you choose that model? A: I EDC 2 knives. On my belt is always one of our Ultralite Bushcrafters. Sharp, small, and because it’s super light, it doesn’t feel like it’s there. On my left side, I carry a Pro-Tech Integrity Manual. I have a lot of respect for the level of engineering that goes into it’s simplicity and materials. When we come out with [REDACTED] later, I’ll switch. Q: When you are not building world-class knives at Bark River Knives what do you do for fun? I’m a filmmaker. A talent rarely used, but I love producing content. You can find my YouTube channel at www.youtube.com/drax02 Be warned, though. It’s some pretty terrible stuff. But, the feeling of accomplishment I get from doing it recharges my batteries and lets me hit that same moment of zen I feel when creating knives. I hope one day to be experienced enough to create at least one short film a year and submit to film festivals. Of course, if there’s knives involved, they will be Bark Rivers. Another Bark River Knives Grind-In is in the books. The annual Fall Grind-In is sponsored by Ron LaBella, owner and chief knife aficionado at the Jerzee Devil Forum. Although not a requirement to be a member, many of the knife makers who descend upon Escanaba, MI are loyal members of Ron’s forum. There was near record breaking attendance, and upon arrival I had a really hard time finding a parking spot. Not only were the employee and overflow parking lots full but there were numerous cars out on the road. Luckily, I managed to squeeze in a spot for Eric (my twin brother and fellow DLT staffer) and we were able to make our way into the Bark River factory. Things were already moving along quickly and smoothly, despite the amount of people that were making knives. The crowd was very diverse, and there were several makers from outside of the country including Canada and Scotland. Since Eric and I decided not to make knives this time around and focus on meeting our friends and customers, we were able to skip the safety meeting and arrive a little later than normal. Though we were able to sleep in a little more on a Saturday morning we did end up missing Mike’s talk he gives at the commencement of the Grind In. Mike Stewart (owner of Bark River Knives) is a colorful, affable guy that has a knack for telling stories and really making things fun. Sadly we missed a few of his one-liners and stories but he was kind enough to make sure he saved some donuts for us. For those of you not fortunate enough to attend one of the Bark River Grind-In yet would be amazed at the spread of food that the Stewart Family puts out. From the meet and greet on Friday night to the banquet meal on Saturday night it seems to be a never ending feast of food. DLT’s owner, Jason, says that the food and camaraderie alone are worth the price of admission at these events. For me, the best part of the Grind In is getting to see old friends and new ones from around the world. One of my favorite parts of my job at DLT Trading is getting to meet like-minded knife enthusiasts from around the globe. It really makes for a fun job when you sell world class products to passionate folks who oftentimes become friends. Having worked on some designs as well as attending these events has also allowed me to create some good friends in the crew at Bark River. These guys on the line are the heart and soul of the knife you buy. The way knives are built at BRKT it is equal parts science and art so without the passion and care of these guys your Bark River Knife wouldn’t be what it is. For the attendees/knife builders the next step after the safety meeting, is determining the design of your knife and beginning the process of making your knife. Attendees can choose from a wide variety of existing designs/blade blanks or even start with a bar of steel and a clean slate to create a completely unique knife. Not only does this flexibility allow you to make just the knife you want, it also allows you to help determine whether you want to make the knife completely on your own or have assistance along the way. Bark River’s crew never ceases to amaze me with their ability to nurture your design and help you to whatever degree you want them to help. They are never overbearing yet always willing to throw you a lifeline if you need it to ensure you leave with a knife that is certainly worthy of boasting and showing off to your friends. Step-by-step you progress from blade design, to shaping, to handling the knife, to final buffing and sharpening. At each step you can choose your handle material, pin choice, liner material and the exact shape of your handles. It is truly a remarkable experience for those who love knives or those who love to see how things are built. For me, it really has helped me to be able to understand the complete knife building process and has allowed me to really improve my ability to answer customer questions on custom and semi production knives. 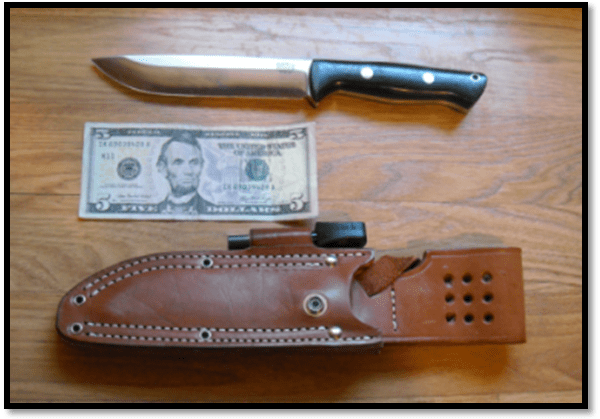 Once your knife is completed the knife goes to be professionally photographed and boxed with a matching leather sheath. After boxing the knife most guys continue to talk knives and help others that may need some assistance getting their knife finished and looking exactly the way they want it. Generally by 3:30-4:00 everyone is done building and ready to shower up and head to the banquet. The banquet held at the Terrace on the Bay is nothing short of incredible. The builders’ knives are brought to the banquet to be admired and viewed by all the fellow Grind In attendees. Several awards are given out for the knives based on judging by all the builders. After judging, a mouth-watering gourmet meal is served. The staff at the Terrace pulls out all the stops for this meal and over the years we’ve had prime rib, lobster thermidor, cornish game hens, and pork medallions just to name a few things. On Sunday you have the option of building a second knife for a small additional fee or you can just go hang out at the shop and talk knives and the outdoors with old and new friends from the Grind In. The entire weekend, from Mike Stewart and family preparing filet mignon on Friday night for the meet and greet to the farewell pleasantries on Sunday, is really something every knife lover should do at least once. Because this event has gone from 8-10 builders back when it started to full capacity with a waiting list it is imperative you reserve a spot early if you plan on attending. For details on attending contact us at DLT Trading or you can reach Bark River Knives directly at 906-789-1801. If you attended this Grind-In, post your experience below.